In 1568 the Dutch began their long battle for independence from Spain and would remain at war intermittently for 80 years. The problems faced by the young Dutch republic played an important role in the military reforms that would take place there over several decades to come. 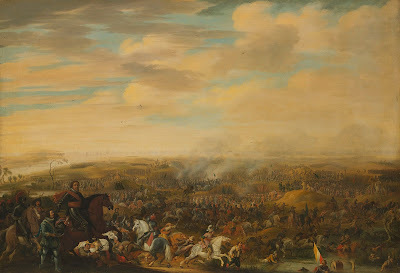 Although many of these reforms centred on infantry organization, drill and tactics, the nature of warfare in the Netherlands would be one of many more sieges than battles. The name most often associated with the Dutch reform movement is Maurice of Nassau (1567-1625). He was the son of William the Silent who had been one of the main leaders of the Dutch revolt. In 1684, at the age of only 17, he became Stadthalter of Holland and Zeeland. In 1590, he was made captain-general of all of the Dutch forces and was then in a position to undertake his reforms. Like many of the military men of his age, Maurice hoped to emulate the military establishments of antiquity, in particular the Romans. Maurice read military manuals from antiquity, in particular those of Vegetius, Aelian, and the Taktika of the Byzantine emperor, Leo, as well as the works of contemporary commentators such as Justus Lipsius. What emerged for Maurice was an emphasis on regular standing forces and the importance of discipline and drill. But within the context of classical antiquity, Maurice also saw the importance of making more effective use of the constantly improving technology of gunpowder weapons. One of the most important changes instituted by Maurice was the creation of a standing army. The army was still made up primarily of foreigners serving for pay. Some of these were mercenaries in the traditional sense, while others were foreign troops sent by their monarchs to serve under Dutch command and at Dutch expense (notably from England). In 1603, for example, the Dutch army consisted of a total of 132 companies. Of that number there were 43 English, 32 French, 20 Scottish, 11 Walloon, 9 German and a mere 17 Dutch. 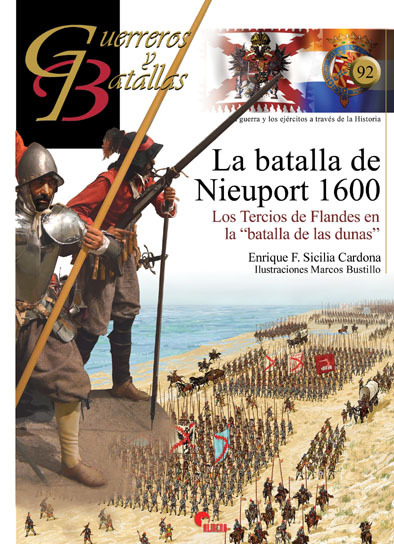 The main reason for the preponderance of foreigners was the relatively small population of the Netherlands, combined with the need to keep an army in the field almost constantly for 80 years. Maurice recognized that keeping these companies in his service all year round, rather than discharging them in the off-season or at the end of a campaign, would make the Dutch army a more effective fighting force in the long run. The maintenance of this standing army also allowed Maurice to initiate new standards of discipline and drill. In this, Maurice was aided by his cousins William Louis and John, counts of Nassau. Maurice and his cousins oversaw the standardization of drill, and equipment, so that all the troops in Dutch service would be using the same methods regardless of their origin. The length of the pike and the armour of the pikemen, as well as the length and calibre of firearms were all standardized. Perhaps more important was the codification of drill at this time in the 'Dutch Discipline'. All words of command as well as the manual of arn1S for both the pike and arquebus and musket were regularized. In 1607 Jacob de Gheyn's Wapenhandelinghe was published - a complete manual of arms for pike, arquebus and musket illustrated with 116 plates, accompanied by the appropriate commands and a commentary. Maurice also modified the military organization and tactics of the Dutch infantry. Once again Maurice turned to antiquity for inspiration. He hoped to replicate the flexibility of the Roman legion by creating units based upon the cohort to replace the large unwieldy regiments and tercios of his own time. To that end, he reorganized each Dutch regiment into two or more battalions. In theory, each battalion was to be 550 men, the same size as a cohort in Vegetius' antique legio, and was made up of 250 pikemen and 300 men armed with firearms, 60 of which were to form a line of skirmishers. 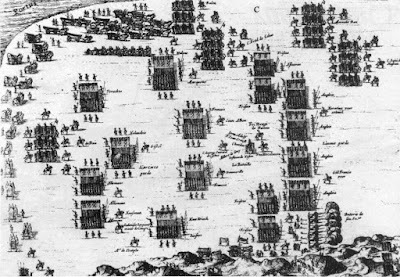 The pikes were to form in the centre of the battalion with arquebusiers and musketeers on the wings. 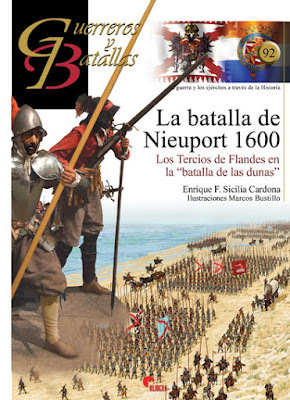 Moreover, these units drew up in fewer ranks than the earlier regiments and tercios; figures vary but the pikes seem to have been between five and ten deep and the shot between eight and 12 ranks deep. The shot were trained to use countermarch fire, a tactic inspired by Aelian. In this formation the files of shot had intervals between them wide enough for a man to march. The first soldiers in the file would fire a volley and then do an about face, marching back through the intervals and join the rear rank, all the while going through the drill to reload their weapons. This would be followed by the men of the second rank and then the third and so on. By the time men from the front rank returned to their original position, they would be reloaded and ready to fire another volley and start the drill all over again. This method of firing required great discipline but created a constant volume of fire from the unit. 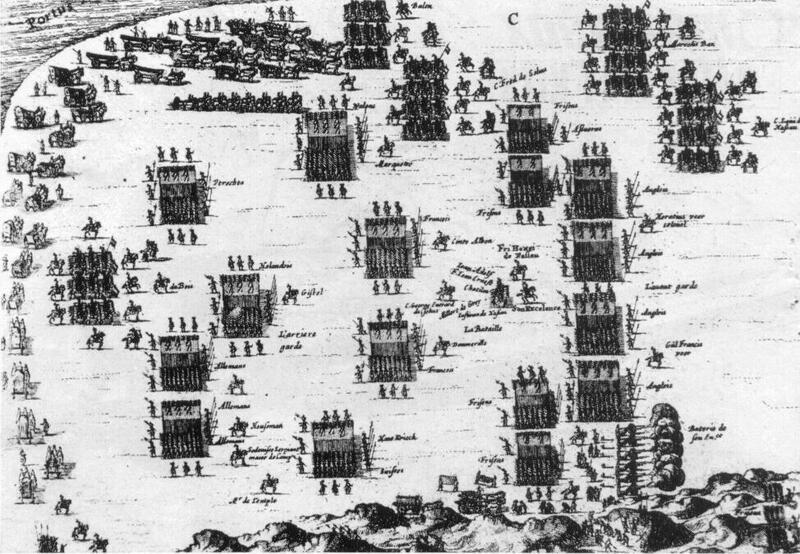 When threatened by cavalry, the arquebusiers and musketeers would retire behind 26 the pikes without disrupting the formation. In battle, the Dutch usually formed their battalions in three lines of battle. These lines could be staggered to resemble a chequerboard so that the battalions in the individual lines could support one another. This bears a striking resemblance to the Roman acies triplex of a legion drawn up in similar formation. Maurice laid the foundations for the early modern standing army based on constant drill and a high standard of discipline. He also developed a system of tactics that truly integrated pike and shot in a coherent fashion. Ironically, throughout the two decades of conflict with Spain, Maurice was only twice able to take his army into battle (both were victories), yet found himself participating in no fewer than 29 sieges.